Spanish mackerel fishing in Islamorada and the Florida Keys is some of the most action packed fishing you'll find. Since the net banning in the gulf and surrounding waters, they've made a great comeback in the last decade along with other species such as pompano. Fishing for them is relatively easy given the right conditions. They average a couple pounds though can grow to several, and their speed and strike intensity makes them a favorite of many anglers on light tackle. The best time to fish for mackerel is usually the winter time. They begin to show up in numbers in November, and as the water cools more larger numbers will show up. Often times larger fish show up earliest when fishing for them starts getting good. 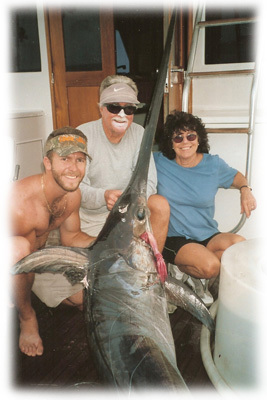 The best areas to fish for them are on the edge of the gulf of mexico, west of nine mile bank and further out. You can stop almost anywhere out here and have a shot at finding them, though if you get a day when the sun is overhead and you can see, look for areas where you see any kind of structure or white holes. They also often show up around the bridges and on the patch reefs on the ocean side, as well as in Florida Bay. A Clean 'muddy' water is something you want to look for, this is where they will be biting best. If the water is too dirty they often may not be around, nor will it be real good if the water is crystal clear. Once you catch them good a few times you will be able to tell when the water is right. Islamorada Spanish Mackerel also prefer the water temperature to be 70-80 degrees, they will bite down to around 65 though obviously will be tougher. In cold conditions the mid afternoon is best as it is going to be the warmest time of day. The best conditions are going to be when the tide and wind are going the same direction, as this will help carry your chum line out far and bring fish in from a long way. If the tide is going into the wind, fishing will likely be tough. Often times if this is the case, you can drift and chum and have better luck. Obviously putting a chum bag out is your best bet. A block of chum should last you for close to an hour while Florida Keys Spanish Mackerel Fishing. Adding menhaden or similar oil and help attract fish, and make your chum slick last a bit longer. Mackerel like shiny jigs tipped with shrimp the best, though regular jigs or just a plain hook and shrimp will work. In colder conditions, often floating live shrimp will entice bites. They also will hit artificials such as clark spoons or anything shiny when biting good. They are very toothy so a wire trace is usually necessary, though I will also just use heavy mono leader such as 60# test as it takes a while for them to wear through it, and it is much easier to deal with than twisting wire when your hands are wet and slimy. Other species you will often catch are jacks, blue runners, ladyfish, pompano, mangrove snappers, and trout, among others. If you care to catch these other species, letting your jigs sink will often yield one of them. Pinfish are plentiful in the chum slick most of the time, catching these on hair hooks can produce good size snappers when cut in half. Also if cobias pop up on structure these are very good baits live for them. Using lighter leader will likely entice the larger snappers and trout to bite. Be careful of catfish and leather jacks as they are both poisonous. Catfish are obvious to tell, leather jacks are small, shiny fish with bright yellow tails. In many areas the large blacktip sharks will swarm especially when big schools of mackerel are biting. To fish these it takes much heavier tackle. I'd suggest heavy spinner such as a BG 90, or conventional tackle such as TLD 20s. Basically have your main line with a wind-on leader of 60# test with a couple ounces of lead (or enough to keep you on or near the bottom). Attach this to a swivel. Then have a piece of #9 wire at least a couple feet long with an 8/0 J hook. Cut a mackerel in half and put the head out for the best shark bait around! Chumming with mackerel pieces will help bring the sharks in, though often if the tide/wind is right there is not much need to do this. These big sharks often go nuts and jump, twist, and break off. I usually fish fairly light drag to start and just let them do their thing, once the shark settles down you can tighten down, and chase if necessary. They will straighten hooks so beware! You can use a similar rig to fish for goliath groupers as well if your fishing any kind of structure and they are around. Though I would recommend an 8/0 circle hook instead to prevent gut hooking these protected fish! Good luck learning how to catch Spanish Mackerel in Islamorada!